Maybe you’re planning a visit to see one or both of your aging parents after a period of not seeing them. Like a lot of adult children of elderly parents, you may worry about how they’re managing and whether they might need assistance. If that’s the case, your next visit to see them can be a valuable opportunity to gauge how they’re doing. Perhaps you won’t notice anything new or out of the ordinary during your next visit to see your parents. However, it’s possible that you’ll spot worrisome clues of trouble or see crises unfolding before you eyes. Take the time during your visit to be a bit of a double agent, sniffing out the following eight potential signs of trouble. You're not being nosy, you're being proactive and smart. 1. Give a big hug. Increased frailty. If you can notice something "different" about a person's strength and stature just in a hug, it's noteworthy. Pay close attention to how your loved one walks (shuffles more?) and moves (rises easily from a chair? has trouble with balance? ), comparing these benchmarks to the last time you were together. Obvious weight gain. Injury, diabetes, and dementia (because the person doesn't remember eating and has meals over and over) might be the cause. So can money troubles that lead to fewer fresh foods, more dried pasta and bread. 2. Riffle through the mail. Unopened bills. This can be a sign that your loved one is having difficulty managing finances -- one of the most common first signs of dementia. Letters from banks, creditors, or insurers. They may be routine business. But it's alarming if they're referring to overdue payments, overdrawn balances, recent accidents, or other worrisome events. Thank-you messages from charities. Older adults are often vulnerable to scammers, and even those who have always been fiscally prudent are vulnerable if they're having trouble with thinking skills (a common sign of Alzheimer's disease). Some charities hit up givers over and over, and your loved one may not remember having donating the first time. 3. Take a drive -- with Mom or Dad behind the wheel. Signs of impaired driving. Tailgating, slow reaction time, going consistently below speed limit, confusing gas and brake pedals are signs to watch for. See 8 more ways to assess someone's driving. 4. Inspect the kitchen -- fridge to counter to cupboards. Perishables past their expiration dates. Your loved one might be buying more than he or she needs, as we all do -- but you want to be sure there's a reasonable ability to ditch the old stuff (rather than use it). Multiples of the same item. Ten bottles of ketchup or a dozen different vinegars might indicate he or she can't remember from one shopping trip to the next what's in the cupboards at home. Appliances that are broken and haven't been repaired. Check the microwave, coffeemaker, toaster, washer, and dryer -- any device you know your parent used to use routinely. Signs of past fire. Look for charred stove knobs or pot bottoms, potholders with burned edges, a discharged fire extinguisher, smoke detectors that have been disassembled. Accidents happen -- but accidental fires are a common home danger for older adults. Cobwebs, signs of spills that haven't been picked up, or other signs of housekeeping that's more lax than it once was. Spills are a common sign of dementia -- the person lacks the follow-through to clean up after a mess. Or your loved one may have physical limitations and simply need more housekeeping help. 6. Notice how the other living things are faring. Plants that are dying, dead, or just gone. How well other life is looked after may reflect how well your parents can look after their own lives. Animals that don't seem well tended. Watch out for dogs with long nails, cat litter boxes that aren't changed routinely, dead fish in the fish tank, or any animal that seems underfed or poorly groomed. 7. Walk around the grounds. Signs of home maintenance problems. Look for discolored siding or ceilings that might indicate a leak, gutters choked with leaves, broken windows or fences. Newspapers in the bushes. Check for papers that were delivered but ignored. Mail piled up in the mailbox. Watch for this indication that your loved one doesn't even retrieve it regularly. 8. Ask eyewitnesses: Talk to those in your loved one's circle. Stories that reflect your loved one doesn't get out much. "We don't see her much lately." "She doesn't call anymore." "She quit bridge club." Stories that reflect that your loved one has complained about health or needs extra assistance getting basic chores done. "Has he had that heart test yet?" "We were worried the day the ambulance came." Hints of concern in their voices. Listen for comments about your loved one -- about his or her health, pets, anything. 9. Observe your loved one's mobility. Trouble walking and moving around can make it tough to complete routine activities of daily living, making in-home care a much-needed help. Mobility issues can have far-reaching effects on your loved one’s physical and mental health. Trouble getting around the house. Does your parent struggle to get up and down stairs, shower or get in and out of the front door? Bruises, new complaints of pain, or other evidence of a fall. Falls are all too common among aging adults, and they can be an urgent warning sign that your parent is no longer able to get around without help. Limited mobility can lead to a host of other problems, from malnutrition to social isolation. An in-home caregiver can help your loved one get where they need to go, with grocery shopping trips and other errands and provide valuable companionship. 10. Watch for signs of forgetfulness. We all forget things sometimes – the name of that book you read, whatever it is you walked into the room to get. But increasing incidents of forgetfulness over time may indicate that home care help is needed. Forgetting important items on their to-do list. Does your parent forget essential to-dos like taking medication or paying bills? Forgetfulness that interferes with their everyday activities. f your parent is unable to remember routine tasks like taking out the garbage or how to prepare a simple meal, it’s a good indication that they should see a physician about their memory problems, as these may be signs of cognitive decline. 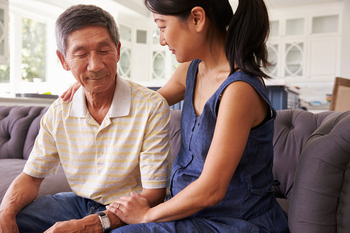 If you’ve noticed that your aging parent isn’t able to take care of themselves or their homes the way they used to, it may be time to consider getting them additional help, such as in-home care or assisted living. These options are especially relevant if you are helping to care for elderly parents from a distance. Caring.com provides consumer reviews for thousands of in-home care services and assisted living communities to help you find high-quality care. With contributions from Laura Dixon.